Thomas Jefferson Kitts | Blog: Does Anyone Speak Dutch? I have no idea what this says. Can anyone help me out? 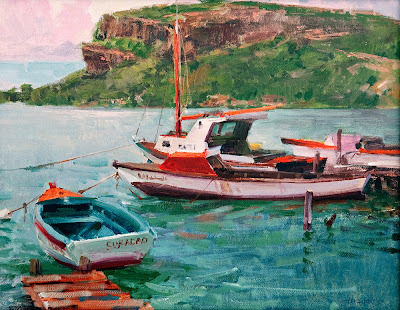 Translation provided by courtesy from Cynthia Roosberg, sister of Hellen Chirino – the woman behind Plein Air Curacao. Thank you Cyntha! Headline: Landscape artists capturing Curacao on canvas. Photo caption: One of the artists trying to capture the landscape of Caracasbaai, Thomas Jefferson Kitts. Article text: This morning about 15 easels and artists appeared amidst the beachtowels and swimmers at the Caracasbaai. Plein air Curacao has taken off! Local and international artists will be working here untill sunset. This should provide entertainment for the public. The next few days the artists will try and capture the landscape at various locations.Wednesday they will be at the Santa Cruz, Thursday at the Hyat and Friday at Cura Hulanda. The resulting art can be viewed and purchased at the Maritime Museum. On Saturday morning there will be a 4 hour long competition in Punda, Otrabanda and Scarloo. Participation is open to all and will cost 15 gld for children up to 18 yrs. Adults will pay 25 gld. Prizes will be presented in 4 categories at 13.30. Categories are, local artists, foreign artists, ages 13 to 18 and aspiring young artist from 19 years on. On Friday and Saturday the students of Instituto Buena Vista and a number of patients of teh Capriles Clinic will work on a mural at the Rif Stadium. On saturday about 30 young children will be painting in Punda. "The caption reads: One of the artists that captured Curaçao this morning at Caracas Bay, Thomas Kitts"
Also, your video is posted on their website now. Yes, but not such small print! Congrats on your successes this summer!! It says something like..."Funny man entertains the local kids with balloon animals and magic tricks. Ouch Randy, that's funny! And pretty close too. The print is way too small to really make out (even enlarged) but Dutch is one of the languages at Google translator and the headline translates as Landscape Painters Capture Curacao on Dock. If I remember my Dutch ( web translation is never accurate ) it says: "Artist suspected in daring bank holdup". Coincidentally, while I was in Telluride last July, there was a bank robber caught hiding a few houses down the street from my host's house. Not kidding.